When the smoke alarm sounds, get outside and stay outside! Remind people and reinforce the safety message: if fire strikes, every second counts. 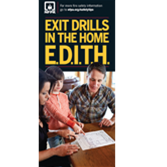 Newly updated, NFPA®'s Exit Drills In the Home (E.D.I.T.H) Brochures are the perfect plan to prepare families to get out quickly and safely with nearly 30 tips, including tips for people who live in multi-story buildings. Easy-to-read and understand, all of the tips in the Exit Drills in the Home (E.D.I.T.H.) Brochures are specific and detailed, leaving no questions about what to do if the smoke alarm sounds and how to make a safe escape! How to create an escape plan and take precautions for children, older adults, or people with disabilities. Five ways to practice an escape plan the right way. How to be prepared for fire emergencies. Best way to make a safe escape in the event of smoke and fire. What to do if occupants of the structure cannot get outside. The importance of installing and maintaining smoke alarms.